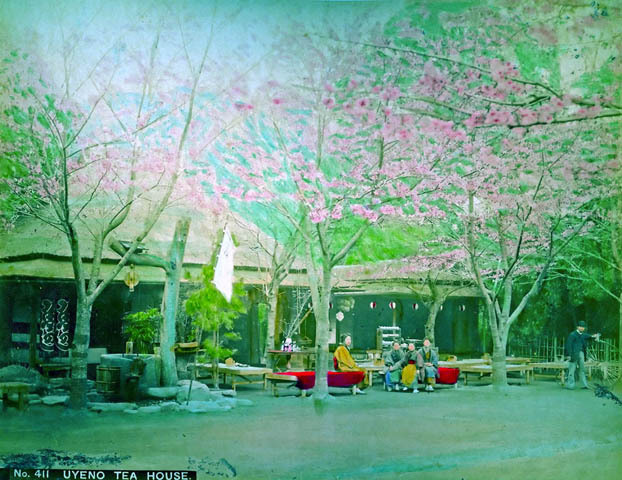 The next picture is of a Tea House in Ueno during spring. (Note the spelling as 'Uyeno'). Unfortunately, the original photo was significantly overexposed so a good bit of the detail was blown out. The artist did an admirable job of providing some amount of detail. I also converted the picture to LAB color (nothing to do with laboratory) and worked with some shadow/detail tools to bring out as much detail as I could from the original photo. It's not the best in the collection but I like the well, the rendition of cherry blossoms and those posed in the picture. This is a good reference to the Japanese Tea Ceremony. And this one, perhaps focused a bit more on the spirit of the tea.